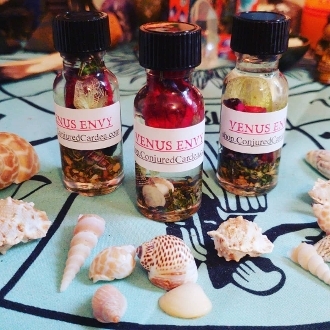 Don't envy the powers and seductive qualities of Venus-invoke them for yourself and take your magic and empowerment to a new Venusian level! Created with wild Rose's, vanilla bean, damiana, lavender, amber and more. Can be used for love matters or any working that needs extra power, passion and creativity added to it. Venus' qualities also help with success and finances. Created during the proper astrological phase, hour and day of the week for Venus.